My better half is home sick today, so naturally I leveraged his discomfort as an excuse to 1) “work” from home and 2) stock up on some of those “only-eat-‘em-when-you’re-sick” treats that we typically otherwise don’t keep around the house. Of course, I’m referring to Gatorade, Popsicles, and a personal favorite – Saltine crackers. I know what you’re thinking. Crackers? Really? Well, listen up. Saltines alone? Meh. 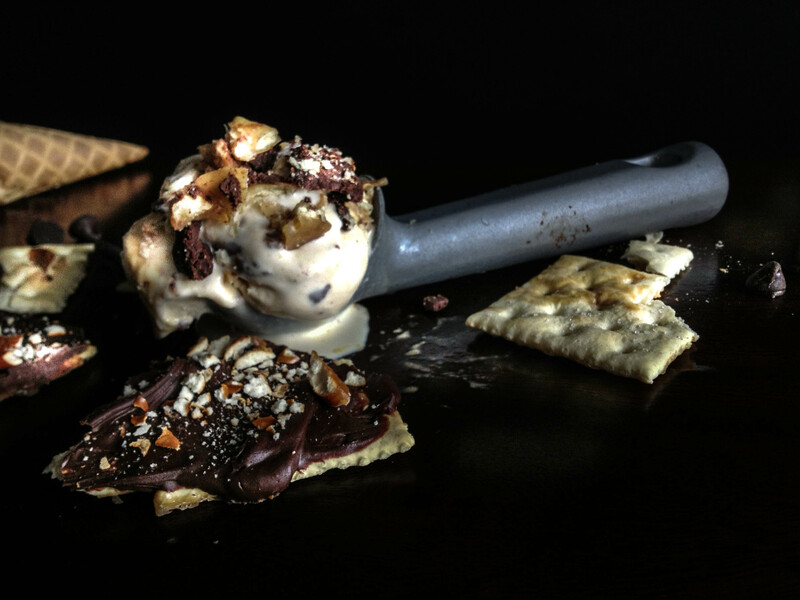 Saltines covered in toffee and chocolate and crumbled atop caramel ice cream? Yeah, that’s what I thought. 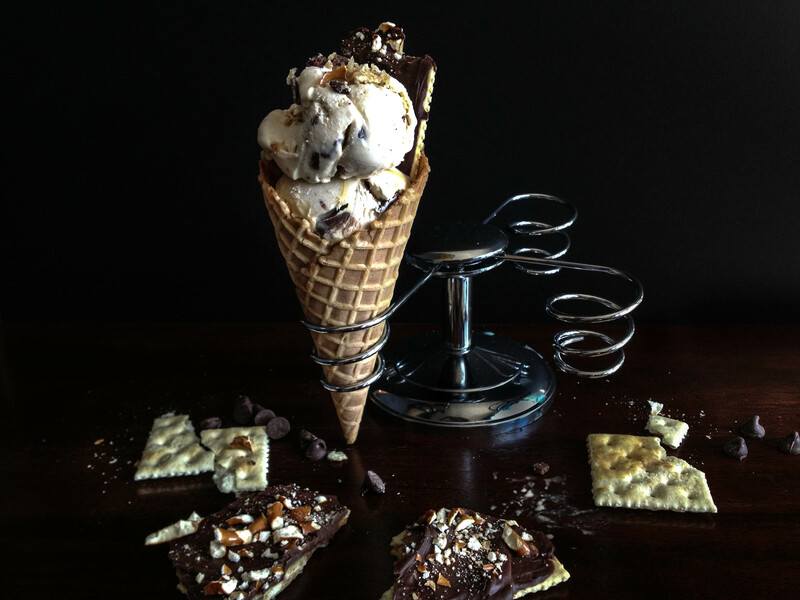 Saltine Toffee, as it is commonly called, is nothing new. In fact, I was probably one of the last people in the universe to discover its magic. A childhood favorite for many, this sweet and salty treat didn’t come into my life until I was much older. However, when I pulled up to the address that I was given, what I found wasn’t exactly the makings for an episode of Dateline: I saw only a big, beautiful house in pristine condition, with two Golden Retrievers wagging their tails happily on the front porch. As I sat in the waiting room (which was really the home’s kitchen), the mechanic’s wife, who was wearing an apron and smelled like vanilla candles, offered me a plate of her homemade toffee bark. It very well could have been crack, for all I knew. Chocolate-covered crack. 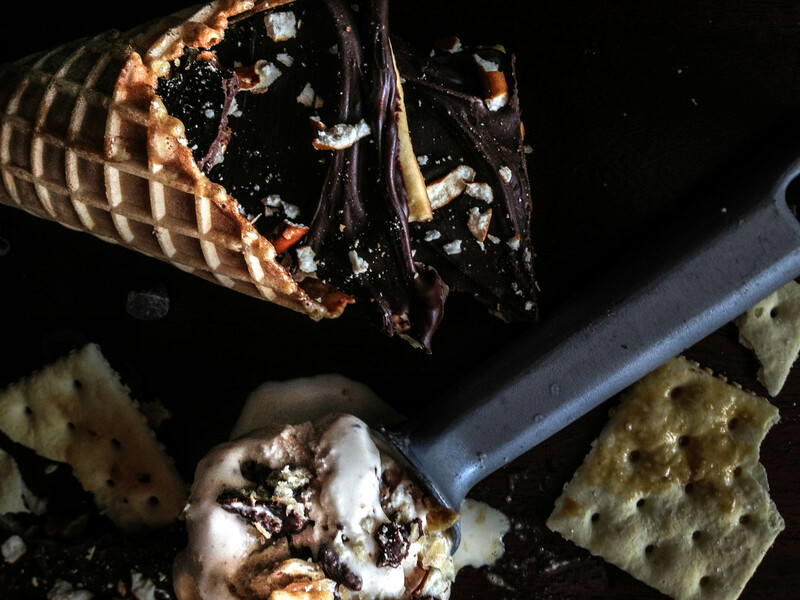 Salty and sweet, chocolaty yet buttery…. I was in love. “How did you do that?!? !” I cried, eyes wide with curiosity. When she told me that the secret to this wondrous treat was a sick-day food that I had been eating all of my life, I experienced a moment of bitter regret. Is this what the rest of the world was doing while I was foolishly dipping my saltines in canned chicken noodle soup? When the Volvo was fully recovered and ready to go, the mechanic’s wife handed me a plateful of the delicious toffee, complete with a recipe card. I am forever grateful to this sweet little lady for showing me what my life had been missing all those years. When I got home that evening, I finished the entire plateful of toffee within half an hour. Right away, I got busy making more. My first batch turned out perfectly, which was quite surprising, considering my culinary talents at age 19 were limited to boiling water and mixing pasta with milk and a powdery cheese substance. Try it on top of caramel ice cream, or as a mix-in to vanilla or butter pecan. Yum!! 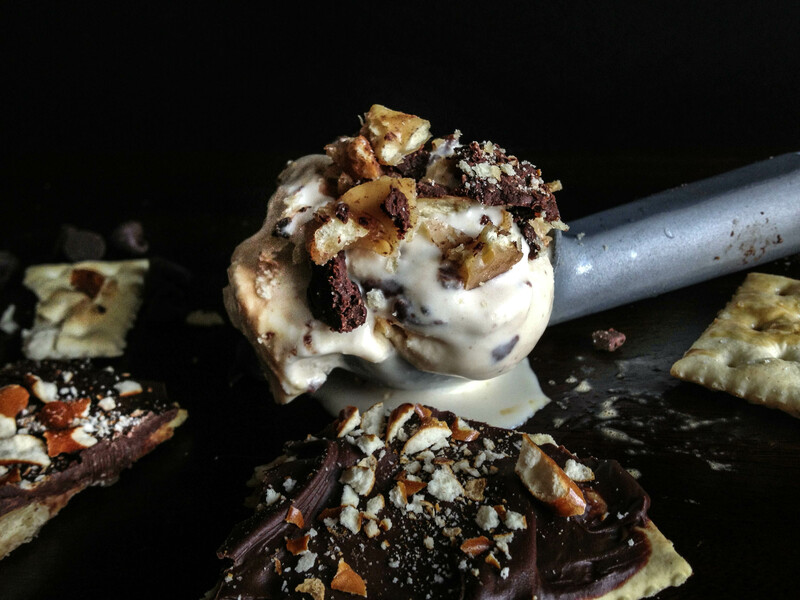 Not only is this toffee delicious, but it’s easy to make as well. 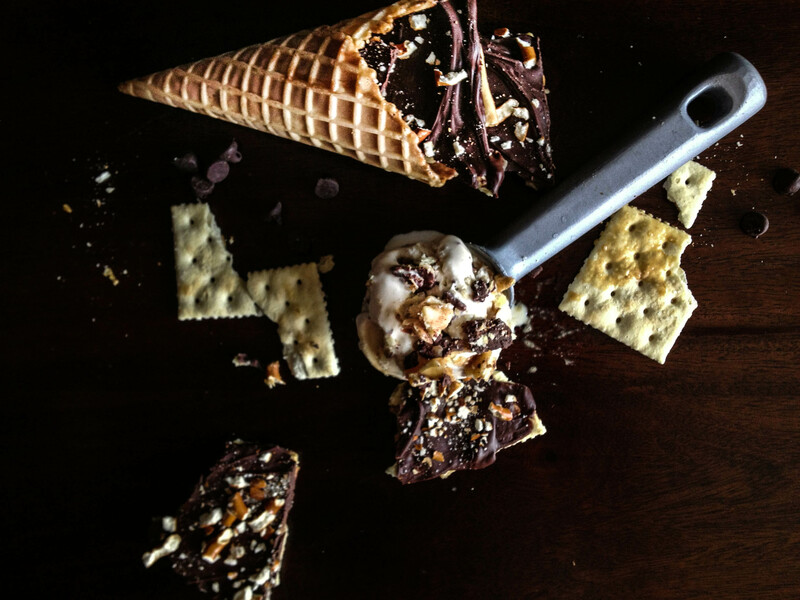 In fact, you only need four ingredients: saltines, butter, brown sugar, and chocolate chips. Then you can customize with your favorite nuts or candies – it’s that simple! I hope you enjoy this super easy treat, and may all your sick days be filled with pajama pants and pints of ice cream. 1) Preheat oven to 400° and line a cookie sheet with foil. 2) Combine the butter and sugar in a small saucepan and melt together until it reaches a rolling boil, about 3 minutes (should look foamy when it’s finished). 3) Lay crackers out side by side on cookie sheet. Pour the sugar mixture on top of the crackers and spread evenly with a spatula. Bake in the preheated oven for about 5 minutes. 4) Remove from the oven and let sit for a few minutes until the toffee is solidified but still quite warm. Then, sprinkle liberally with the chocolate chips. Once the chips are warm and melty, spread in even layer across the top (be patient, it may take a few minutes for the chips to melt). 5) Finally, cover the melted chocolate with the topping of your choice. 6) Place in the fridge for an hour (or until set), and then break into pieces. 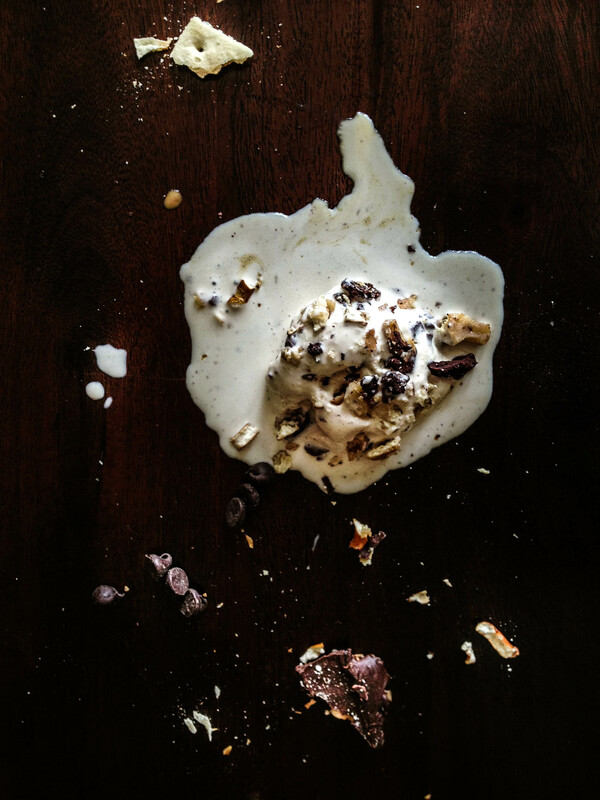 To top ice cream, place pieces in a plastic bag and crush into crumbles. Sounds delish!…maybe someone could whip me up a batch of crack and deliver it right to my front door. I’m not giving a hint, I’m placing my order, lol.